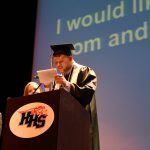 Huntley Community School District 158 recognized 2017 graduates of the LIGHT (Life Instruction Guiding Huntley Transition) Program at a ceremony on May 23. 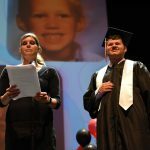 The LIGHT Program is a special services transitional program that aims to prepare students ages 18-22 for independent living with supports for employment and education and/or training. 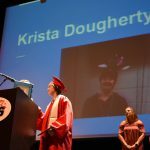 Three students, Krista Dougherty, Brian Gile, and Eli Pitts, were honored. Dougherty also received the LIGHT Shining Star Award. The LIGHT Program works with more than 50 local employers, who provide competitive employment opportunities for students while they work on their educational goals. About 75% of LIGHT Program students are actively employed, substantially higher than the national labor force participation for individuals with disabilities of 20.4%. In addition, each graduate completed over 500 volunteer hours and earned a silver cord for their hard work and efforts. 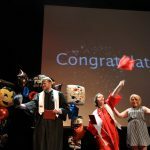 Congratulations to all of the students who graduated, their families, and the community members who support the LIGHT Program.